The Harvard Divinity School announced Tuesday it will continue with plans to remove the red oak tree in front of the Andover Theological Library, despite objections from some Divinity School students and Cambridge City Council’s one-year moratorium on cutting down trees. Bartlett Tree Experts, a tree preservation company hired by the Divinity School to assess the red oak, concluded that the tree is a safety hazard and “in irreversible decline,” according to a statement released by the Divinity School. 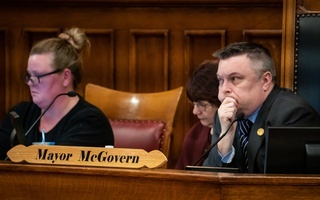 The tree-cutting moratorium, which passed Monday, includes an exception for trees deemed “dead” or “dangerous” by the city’s arborist. The City of Cambridge reviewed the Bartlett report, and the Commissioner of Department of Public Works, the City Arborist, and the Director of Urban Forestry agreed that the tree must be removed, according to the statement. 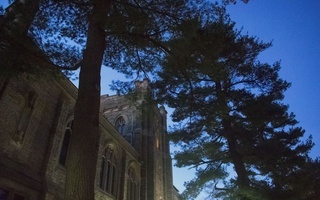 Divinity School students and nearby residents have protested the tree’s removal since September, citing its spiritual and environmental importance, They also criticized the school’s decision-making process. “They’re not taking any input, they’re just planning to cut down trees. It’s like they don’t take their own rhetoric seriously about community engagement and about environmentalism in our own backyard,” Divinity School student Shane H. Brodie said. The tree is currently surrounded by yellow fencing and scaffolding out of safety concern, according to the school. 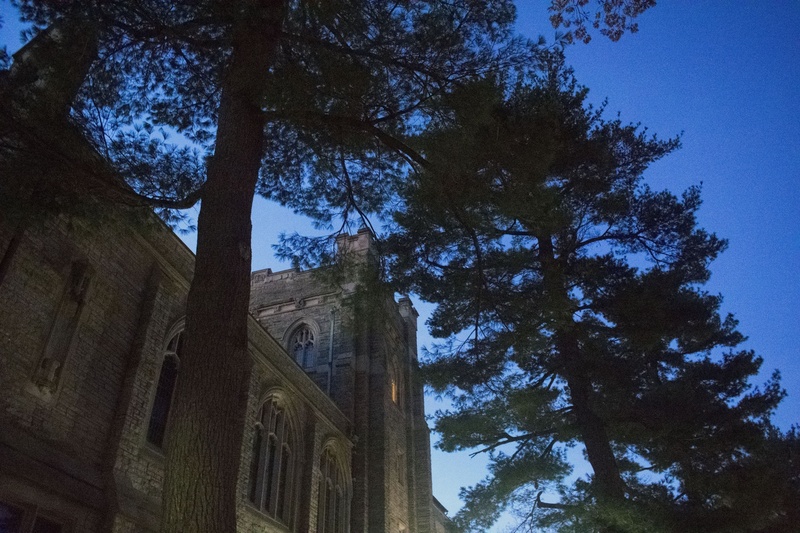 “The fence, especially, seems abhorrent to some of us who still want to treat the tree as if it’s a sentient being,” Divinity School student Gretchen T. Legler said. The Bartlett findings were announced on Feb. 7 at an Agassiz-Baldwin Neighborhood Council meeting. Several students and community members emailed administrators requesting more information, namely that the report’s data be made public, according to Brodie. A summary of the report was included alongside Tuesday’s statement. Divinity School spokesperson Michael P. Naughton declined to comment beyond Tuesday’s official statement. 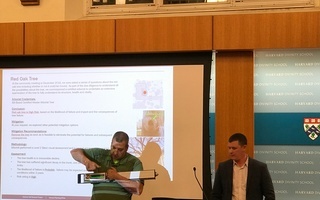 Removing the red oak tree is part of a larger plan to renovate Andover Hall, which includes building a multi-faith space and reducing the building’s carbon footprint. The Divinity School plans to mitigate the loss of caliper and canopy provided by the red oak tree. Brodie, however, claims mature trees provide unique benefits. “Mature trees provide shade, they help with slowing down rain, they help with infiltration of rain into the soil, they provide habitat,” he said. If the tree’s removal cannot be prevented, some students have considered ways to honor the tree, according to Legler. — Staff writer Matteo N. Wong can be reached at matteo.wong@thecrimson.com.